Carbon structural steel has moderate carbon content, has good comprehensive performance, and the properties of strength, toughness, weld ability and so on match very well and the application is the most extensive., which are mainly used in the manufacture of welded pipe and used as stock for cold rolling, etc. Low alloyed high strength structural steel has the advantages of high strength, good comprehensive performance, long lifetime, wide application scope, more economic and so on, which are mainly used in the manufacture of welded pipe, steel structure, etc. Carbon structural steel is also namely high quality carbon structural steel, which has good mechanical properties and machining performance. It is mainly used for various mechanical structures, chain, metal products and all kinds of tools, building, bridge, boiler, vessel, etc. Alloyed structural steel has good mechanical properties and machining property, which is mainly used for all kinds of high- hardness packing strips, blade, chain piece, cutting die, boiler tube, all kinds of automotive parts including angle adjusting device for car seats, etc. Spring steel mainly has good elasticity, and since it is used under the condition of the dynamic load, the main requirement to the material of manufacturing spring is to have high yield strength; it have no plastic deformation when under heavy load; it should have high fatigue strength, and has long lifetime under the frequent load; it should have enough toughness and plasticity to avoid sudden brittle fracture under the impact force. Spring steel is mainly used in the manufacture of all kinds of springs such as helical springs for automotive, locomotive and tractor, spring for automotive safety belt, some important springs working under high stress, and springs subject to serious wear. Production cost of carbon tool steel is lower, and sources of raw materials are convenient; this steel is easy for cold and hot machining, and can obtain quite high hardness after heat treatment; Under the work condition not heated up to high temperature, the wear resistance is also good, thus it is widely used. It is mainly used for making blades and sawing blades with small size and simple shape, also used in textile accessories. 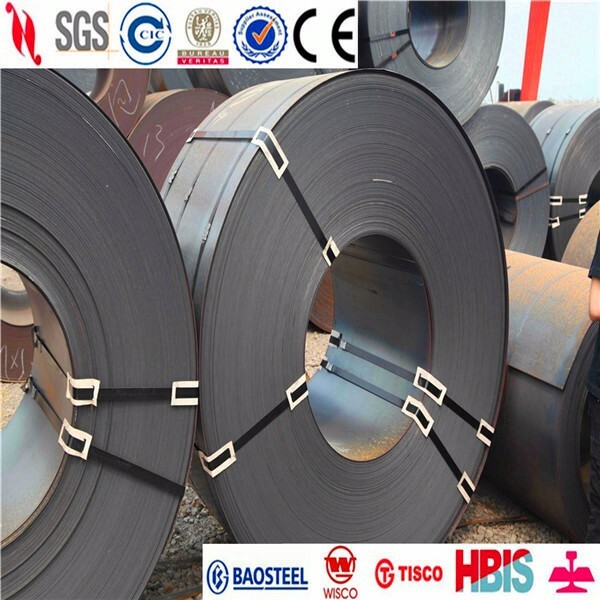 Cold heading steel strip has excellent cold formability, mainly used in industries including automotive, shipbuilding, equipment manufacturing, electronics, electrical appliances, bicycles, tools, light steel structure, construction, etc. Free cutting steel is a kind of alloyed steel adding a certain amount of one kind or more kinds of free cutting elements into the steel including sulphur, phosphorus, lead, calcium, selenium, tellurium and so on, to improve its cutability. This kind of steel can be machined by cutting with higher cutting speed and deeper cutting depth. Due to adding free cutting elements into steel, cutting resistant force of steel decreases, and at the same time the free cutting elements and the formed compound can work as a lubrication for the cutting tool, and crumbs are easily broken and the wear is reduced, which accordingly reduce the surface roughness of work piece and improve the service life of knives and the efficiency of production. It is mainly used for metal wares such as: garden tools, barbecue oven rack, screwdriver, key, etc. High weathering steel is a kind of steel into which a small amount of alloy elements are added, such as Cu, P, Cr, Ni, etc., forming the protective layer on the surface of metallic matrix to improve the plate performance of weathering resistance. It is mainly used for boiler tube, container, etc. Alloyed tool steel is a kind of carbon tool steel into which alloy elements are added, including chromium, molybdenum, tungsten, vanadium and so on, to improve the hardenability, toughness, wear resistance and heat resistance. It is mainly used in the manufacture of measuring tools, blade and saw, cutting tool, shock resistant tool, cold and hot die, and some tools for special application.